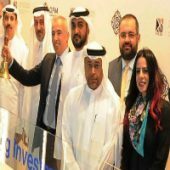 Dubai- March 25th 2018, Dubai Financial Market (DFM) today announced the listing of NAEEM Holding for Investment, trading commenced on the company’s shares under the trading symbol (NAHO), the stock turnover exceeded 370,000 shares and the share price was up 2% by the end of the trading session. Mr. Youssef El far- NAEEM Holding’s Vice Chairman and CEO rang the market-opening bell in the presence of his Excellency Essa Kazim- Chairman of the DFM and Mr. Hussein Shobokshi, Chairman of NAEEM Holding as well as senior representatives from both sides. This listing brings in the total dually listed companies on DFM to 16 and the total number of overall listed companies to 67. Commenting on this milestone, Youssef El far- NAEEM Holding vice chairman and CEO: “We are proud to be the first listed Egyptian company to be dually listed on DFM, we always believed in regional consolidation as the way forward, and tapping the DFM market complements our regional presence, increases the liquidity for our shares and maximizes our shareholders’ value”.